I have 5 sons. That definitely qualifies me as being a BoyMom! Even with one or two you know that being a Boy Mom makes you a unique, strong, and boo-boo mending guru. I have ideas running through my head of the Top Ten Ways you know you are a Boy Mom! 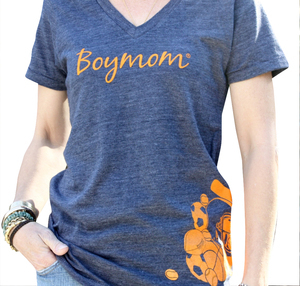 BoyMom has taken that special love we share for our boys and created a line of clothing that tells the world of that love! They sell tshirts, hats, baby onesies and other specialty gifts that make being a boymom extra special! As a boymom we endure so much adventure, intrigue, scraps and fights that we need a shirt that uniquely shares that we have endured and we shall succeed! Many of the shirts show just how much we endure as with this Multi-Sport shirt from boymom. How many games have you sat through as a boymom? And we wouldn't change a thing! This shirt is so soft and comfy! This shirt ran true to size. I loved showing the world that I was a boymom! I just love this line and even though I am a girlmom also, the 5 boys kind of out number my 1 daughter. I was raised as a boymom for many years! Know how hard it is to get a photo with all of my boys, let along all of them acting nice! Well that is the best we could do :) Welcome to being a boymom! A large population of Southeast Asia lives in extreme poverty and political oppression. The average citizen struggles to find enough to eat. Especially vulnerable are little ones who are orphaned. Boymom will donate a portion of each sale to helping these sweet ones who cannot help themselves. 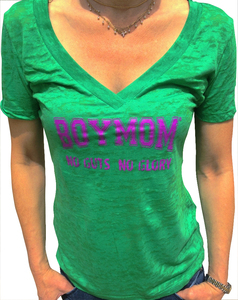 Enter to win this BoyMom shirt! I love the No Guts No Glory shirts. They are so appropriate. I like the NGNG in green :) I have 5 boys and 1 girl that is a tomboy. W117 : ) I alos love all of the No Guts No Glory Shirts. Having 4 boys I agree! Love the gray v-neck with red glitter! I LOVE the cars shirt!